The internet is global – and most website operators don’t just register visitors from a particular country. For example, an English website that mainly attracts British visitors will often also receive visitors from other European countries, as well as from the USA, Canada or Australia. As a participant of the Amazon Associates programme, you can offer visitors from other countries the opportunity to purchase a suitable product via one of your Affiliate links, enabling you to increase your revenue via these visitors from other parts of the world. Since version 1.5.0, our free Amazon Associates Link Builder WordPress plug-in also supports adding geo-targeted Affiliate links in all templates. Find out more about using Link Builder here. 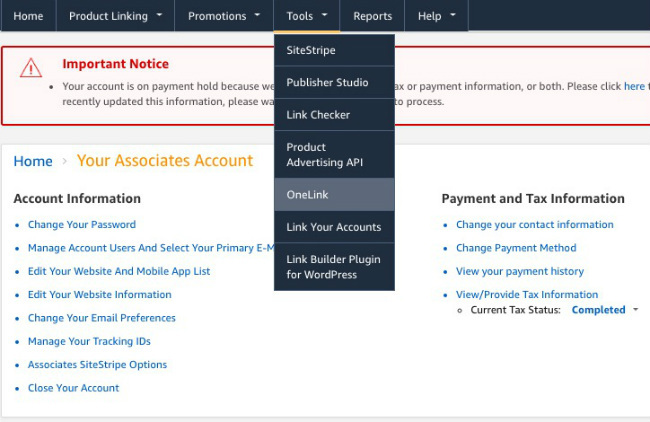 As well as this, you now also have the option of linking multiple Amazon affiliate accounts with the Amazon tool, OneLink, and you can use it to monetise your international traffic. Here, we’ll cover the advantages of OneLink and show you step-by-step how to use it, as well as discussing what you need to consider at this point. 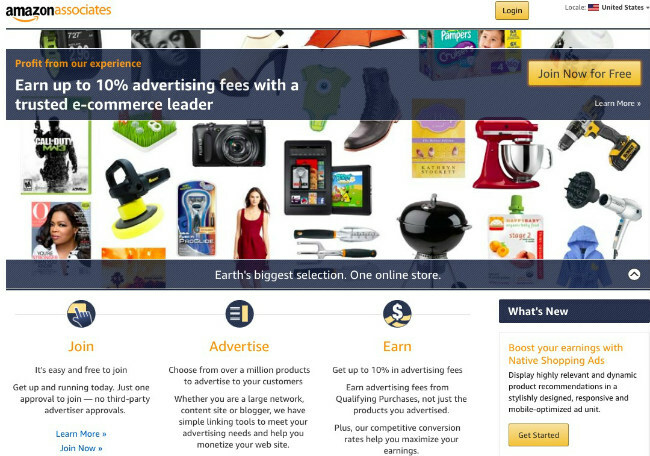 What is Amazon OneLink and what are the benefits of the tool? How do I sign up for the Amazon.com associates programme? How should I integrate OneLink with the step-by-step guide? What Is Amazon OneLink And What Are The Benefits? OneLink is a script-based solution that lets you monetise your international traffic from, for example, the US, Canada, Italy, UK, France, Spain, and Germany, using text links. If visitors from abroad click on one of your Affiliate links, OneLink will redirect them to their local or nearest Amazon store. Here, the respective visitor usually has their own customer account, understands the national language, finds prices in their usual currency and can rely on appropriate shipping costs or even free shipping. OneLink offers your visitors a positive user experience by providing seamless redirection, resulting in a positive shopping experience for your visitors and a better conversion rate and higher revenue for you. Another advantage of OneLink is the global, consolidated report which can be found in Associates Central. Until now, associates who participate in several Amazon affiliate programmes in different countries had to log in to the websites of each respective associate programme to work out which one a purchase was made in, and what revenue was received in form of advertising fees. With OneLink, you can now view a consolidated, global report with country-specific information about the preferred associate programme. However, once you’ve set up OneLink, information of this kind can be easily viewed on Amazon Associates Central without the need to visit the website of any other EU or international affiliate programme. You can also set a preferred currency for all affiliate programmes and use this feature to get a detailed overview of all revenues in one place. For more information about the Global Consolidated Associates Report, click here. As a participant of the Amazon Associates programme, you generally have the opportunity to sign up for other EU associate programmes, such as the Spanish associate programme of Amazon.es. In addition, you may also apply to participate in another seven international associate programmes outside the Amazon EU associate programme. OneLink is therefore of particular interest to those Amazon Associates who have already signed up for several programmes and whose website receives also users from other countries. To use OneLink, you need an Associate account in every country where your traffic comes from, or where you want to monetise your traffic. Therefore, if you have not already done so, sign up for other Associate programmes from other countries that will send you traffic to your website or sites. 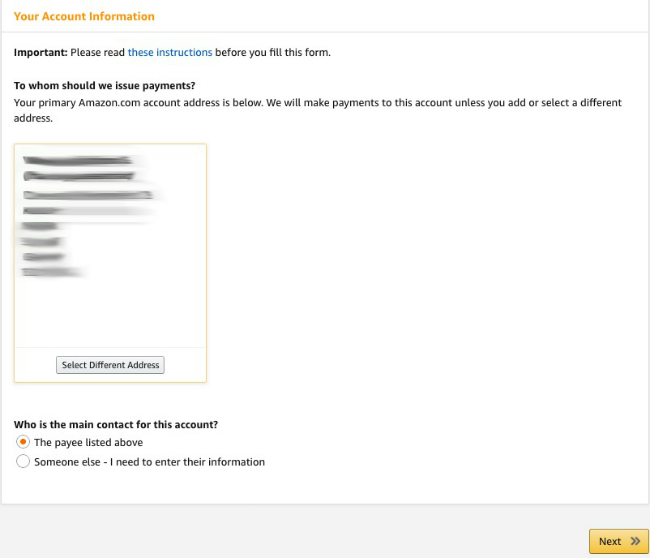 Linking your Associate IDs using the OneLink tool requires a one-time registration with Amazon.com’s US associate programme. If you’ve already done so and you’re signed in, you can skip to Step 5 below. Here, you can visit the website of the Associate programme from Amazon.com. You now see an overview on which the address of your associate account must be entered. If you’re already a participant of an Amazon associates programme, you should find your current address associated with an Associates account in the address field. In the lower part of the overview, you confirm either that you are the payee listed above: ‘The payee listed above’, or another person, including: ‘Someone else – I need to enter their information.’ Then click on ‘Next’ to access the next overview. 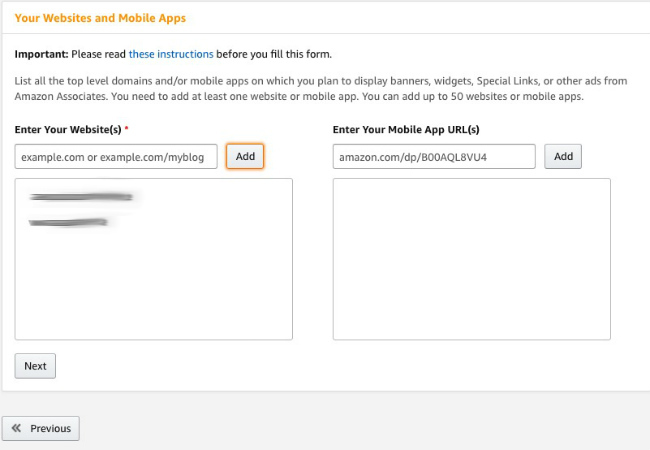 Here, you enter the URLs of your website(s) and mobile apps that you would like to participate in the associate programme of Amazon.com. Then click on ‘Next’. On the next page, your previously entered URLs and mobile apps will be shown again. 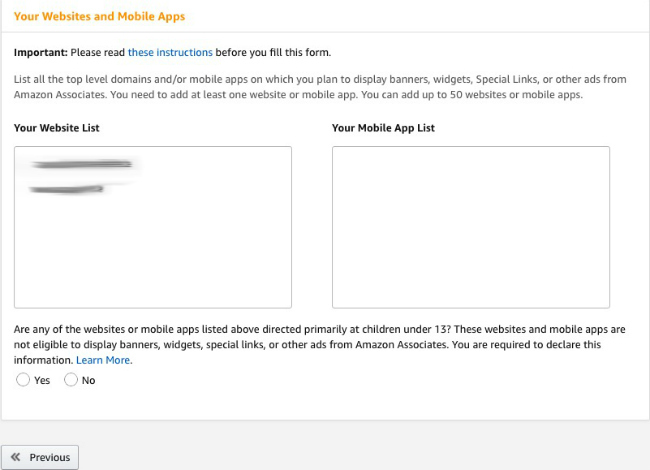 If you have websites and mobile apps especially for children under the age of 13, then in the lower section, check the box next to ‘yes’ – these pages are not eligible to display banners, widgets, special links, or other advertisements from Amazon.com’s associate programmes. For all other websites and mobile apps, tick ‘No’. At this step, you create your website profile. First, enter your desired Store ID, which also represents your first Tracking ID and is embedded in an Affiliate link on your website to enable a smooth allocation of your advertising fees. In the two fields underneath, you can see the URLs of the previously registered websites. Next, you describe your web pages. In addition to a brief overall summary of your website, you’ll add a brief description of the thematic categories each one covers. In the box below, select a category that matches your website. Below that, you can now select product areas you’d like to promote. 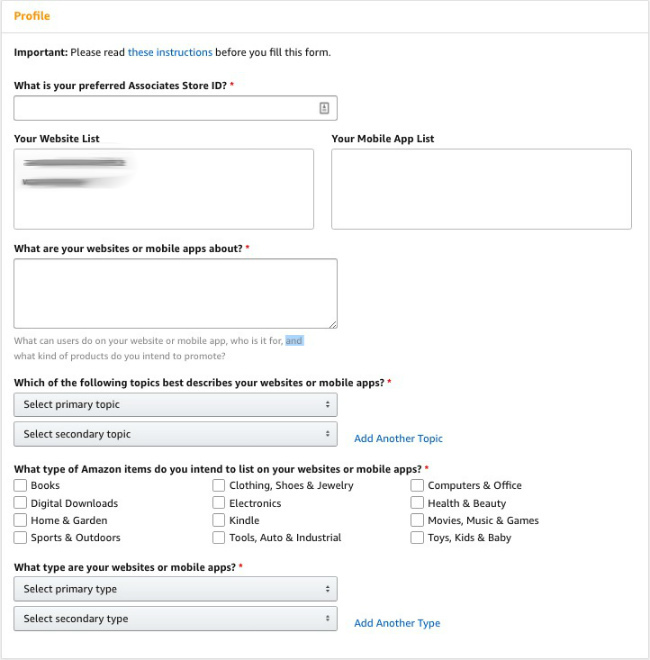 In practice, after a successful application to become a member of the Amazon.com associate programme, you do not need to limit yourself to the product categories that are listed here; rather, the information will help introduce you to Amazon Shop page products that may fit with your website content. Next, you’ll arrive at the ‘Traffic & Monetization’ field. Here’s where you explain how visitors usually arrive at your website and add details about monetisation and your current traffic. Finally, you need to enter the displayed CAPTCHA and confirm the conditions of participation. 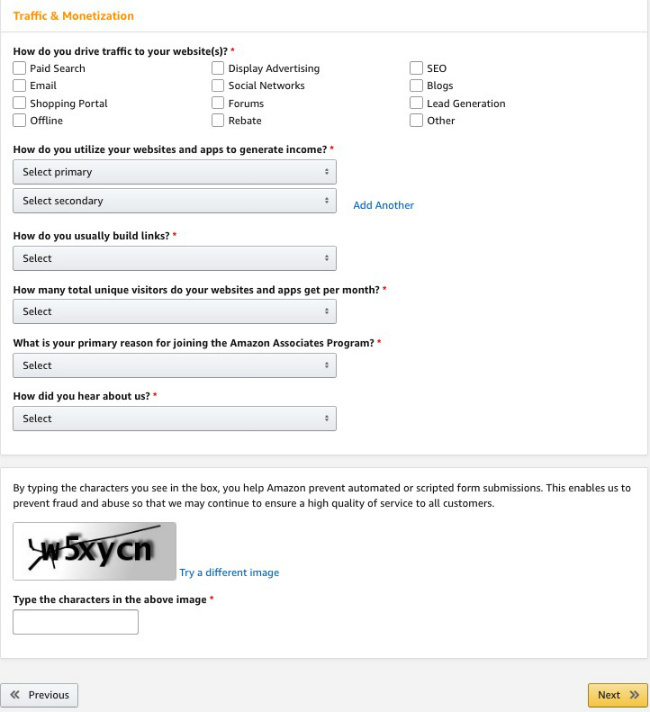 Please read this carefully, to ensure you understand the details of your application for participation in the Amazon.com associate programme. Then click on ‘Next’. To confirm your identity, you’ll be asked to enter your phone number. After doing this, click on ‘Call Me Now’. You will now receive an automated call and will be prompted to enter the four-digit Phone PIN via the keypad of your phone. Congratulations! 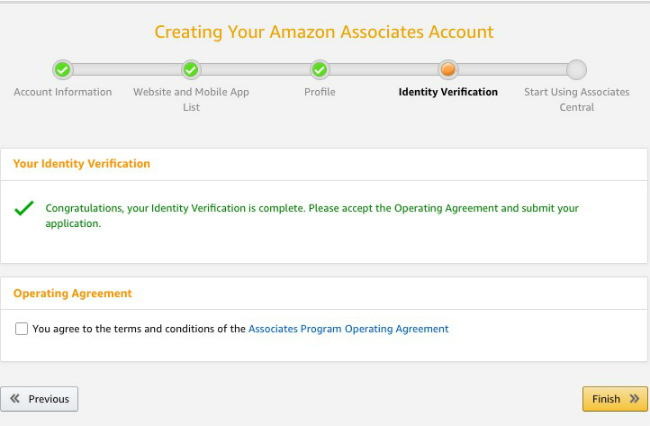 You have successfully signed up for the associate programme of Amazon.com. 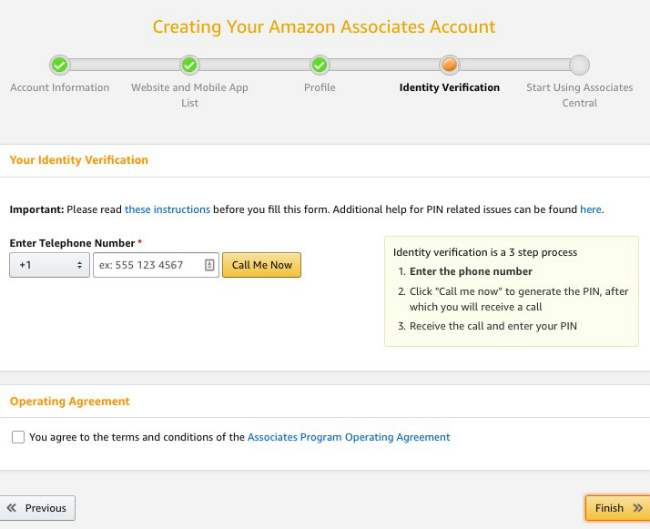 Next, on Amazon.com’s Associates Central, click Tools, then select OneLink to link your Associate IDs and set up OneLink. Now, click on ‘Click here to link’, below ‘Step 1’ in the ‘Getting started’ section, to continue linking your US account to your other Associate IDs. Next, select the countries where you’re a member of the Amazon associate programme and enter the country’s Affiliate ID in the space provided. Then click on ‘Link Store’. 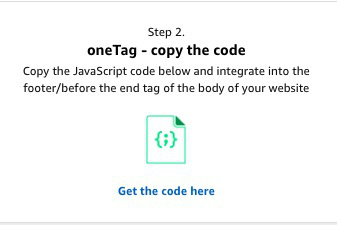 Copy this code and paste it into the footer of your website. The integration of the code works differently depending on the active WordPress Theme, but if you have any problems, have a look at the general settings of your Theme or in the documentation of the Theme to help resolve them. As soon as you click on the ‘View reports’ link below ‘Step 3’, you’ll get to the Reports section in your Associates Central. Under ‘Reports’, you’ll find an overview of your global advertising fees.